Kerosene Follow1 conjures so many food memories for me: scents of — chocolate-coffee-caramel candy my grandmother made at Christmastime and wrapped in foil, the Nescafé Greek-style coffee a friend at work made every morning, steaming chocolate mochas with sprinklings of toasted coconut on top, Middle Eastern honey cake served with a cup of Turkish coffee, tonka bean and espresso crème brûlée. And every association is "sweet" and fits perfectly with the holiday season — when I eat more desserts than any time of the year. But Follow is not overly sugared; its rich-deep coffee and benzoin aromas provide a pleasant "burnt" vibe. Throughout the course of Follow's development, I smell coffee; its base notes are amber-y (amber with, I believe, some patchouli in the mix). If you love gourmand and/or coffee scents, Follow is a must-sniff. If many gourmand perfumes are too sweet for you, try Follow. Since the catastrophe (on my skin at least) that was Atelier Cologne Café Tuberosa, I've thought about the combination of dense coffee and tuberose, so I layered Follow with Frédéric Malle Carnal Flower and it was a match made in paradise — and put Café Tuberosa to shame. (Use one part Follow to two parts Carnal Flower.) I also layered Follow with Dame Perfumery Chocolate Man: deeeelicious. 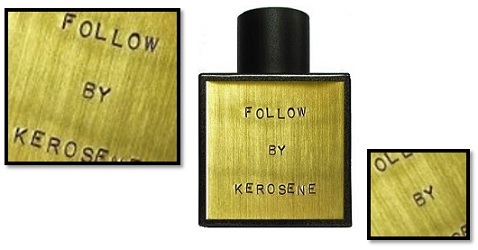 Kerosene Follow Eau de Parfum is $140 for 100 ml. (Please, Kerosene: make a 10 or 15 ml size!) For buying information, see the listing for Kerosene under Perfume Houses. 1. Listed notes of coffee, vanilla, benzoin, amber, sap, tonka bean. They really should do half ounce plain bottles for those of us who prefer variety over the full price fancy bottles. That would also cut down on the decant business, which doesn’t help them much, if at all. Oh well. BF…more companies are doing that all the time; let’s keep our fingers crossed. I should try my sample of this again. I loved it in the vial/on paper, and recall it going weird on my skin. jj, it was just the opposite to me…heavenly on skin, and just OK on a strip. Glad to hear there are other Cafe Tuberosa haters (though I’m not sure why.) I absentmindedly drenched my arm with it while shopping at Sephora and had to quickly find a public restroom to scrub it off best I could. I started having a bit of an anxiety attack realizing I’d be stuck with it on my skin for the entire drive home. Fortunately I was able to remove most of it and then cover it up with something from my purse stash. This Kerosene sounds lovely, though. The description here sounds awesome and I’m a fan of their other offerings (especially Dirty Flower Factory). Definitely worth checking out. Downtown, don’t know where you live, but cool weather is the best time to try this I think. Ha! Then spray with abandon! I’m in Columbus too! We should get together for a sniff fest.! Really good idea, Kevin! I’ve got both of these to layer and I kind of was hoping Cafe Tuberosa worked, but it definitely did not, so maybe this is the answer. Kevin, how did you know that I’ve been searching for the perfect coffee scent? This sounds absolutely fantastic. I really like Intoxicated, but not really interested in paying for the name.???? So I will have to track this one down. Wishing you a joyful and fun holiday season! ????☃???? Laura…I’m a perfume psychic…i request payment in exorbitantly priced fragrances I would never buy myself. Enjoy the holidays! OH my, a lemming alert! Thanks for the review! I remember that you enjoyed La Via del Profumo Milano Caffè, and I wonder how Kerosene Follow compares? I’m very fond of La Via del Profumo / Abdes Salaam Attar Amber Chocolate. Noz…I’ll have to try them side by side. And thanks for the new link!